Italo Lanfredini was born in Sabbioneta in 1948. After studying at the Giulio Romano Art Institute in Mantua under Albano Seguri and Aldo Bergonzoni – with whom he later shared a studio – he enrolled at the Academy of Fine Arts in Florence. The following year he moved to Milan to study at the Brera Academy. He attended a sculpture class held by Luciano Minguzzi and history of art classes taught by Guido Ballo. He met sculptor Francesco Somaini, who was immediately interested in his work and invited him to work in his studio. Before long however, Lanfredini left the studio fearing he would be too influenced by the personality of the successful sculptor. At the start of the Seventies he settled in Mantua. He began teaching Plastic Arts and Visual Studies at the Giulio Romano School of Art. The works Encounters and Source of Life followed by Gods, Venuses and Slashed Columns belong to this period. In the mid-Seventies Lanfredini’s sculpture acquires a broader dimension. His works are no longer objective but converse with the site and its Aura. Thresholds, Labyrinths and Gardens are works to cross through, to inhabit and experience. In 1987 his labyrinth Ariadne won the International Sculpture Competition organised by Antonio Presti, originator of the open air museum Fiumara d’Arte. The work was created in 1988-89 on the headland of the Nebrodi Mountains at Castel di Lucio (Messina). At Pradello, Villimpenta in 1996-97 he designed the Garden of Regenerating Powers. 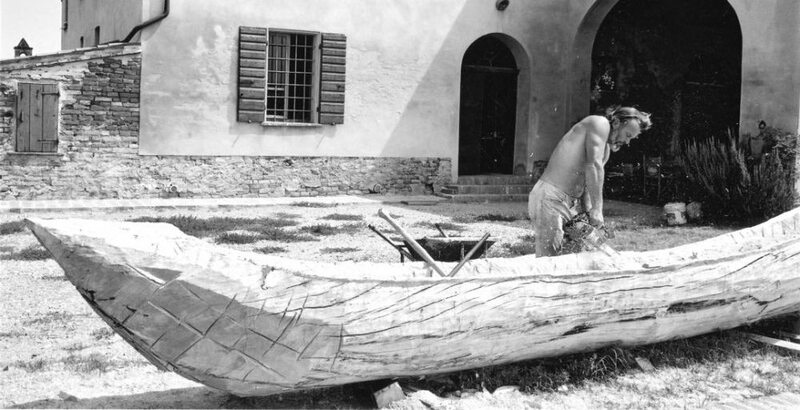 During the same period he opened his studio-home La Silenziosa, a sort of permanent museum where works including the Big Ray, Earth of the earth or garden of the soul, Origin, The nests, Womb of the Seed and many others are located. He lives and works at La Silenziosa (Commessaggio, Mn), which he likes to think of as an open place for interchange, meetings and interaction.